This pot can replace the 2nd tone control on a guitar with 2 tones such as a strat. It is intended to function as a 2nd "master tone" which effects all of your pickups. When the pot is centered on 5 it is neutral. When you turn the pot counterclockwise it provides a noticeable dip in the midrange frequencies. The actual frequency dipped is in the 850 hz range (see graph below), but this will vary somewhat depending upon other factors relating to your particular guitar circuit. When you turn the the pot clockwise from 5 up to 10 you get a slightly hotter sound. WILL IT WORK ON A BASS? The midrange cut aspect of the control works well on a bass. We sell a passive mid-scoop / tone swtich (MTB) voiced specifically for the bass guitar. WILL IT FIT AND DOES THIS REQUIRE ANY ROUTING TO MY INSTRUMENT? No routing required! As you can see from the picture, the midrange shaper is attached to a standard sized 24 mm CTS split shaft pot. For the new custom taper model with center detent this is only available on a split shaft pot, but the original "orange" midrange shaper is available on either short scale split (for Strats), large scale splits (for Gibsons) or solid shaft pots for any other guitar that has knobs fastened with set screws (like Teles). CAN I GET THIS MOD ANYWHERE ELSE? Other vendors sell similar products, but you will not find another vendor offering this with a center detent on a high quality 24 tooth customer taper genuine CTS split shaft pot that fits perfectly into a Strat style guitar. After much R&D we have arrived on the perfect taper for this mod which is a hybrid between audio and linear. DOES THIS REQUIRE A BATTERY? NO! This is totally passive. WILL IT WORK WITH HUMBUCKERS? The 0-5 part (mid-cut) works equally well on humbuckers or single coils, however the 5-10 part will not be very effective on humbuckers. WHAT IS THIS CIRCUIT, AND DOES IT REALLY "BOOST" MIDS? This kind of circuit is referred to as an LC Network, where L stands for Inductance and C for capacitance. An LC Network does not "boost" anything, but rather provides some interesting tonal filters, somewhat similar to the old Gibson varitone. 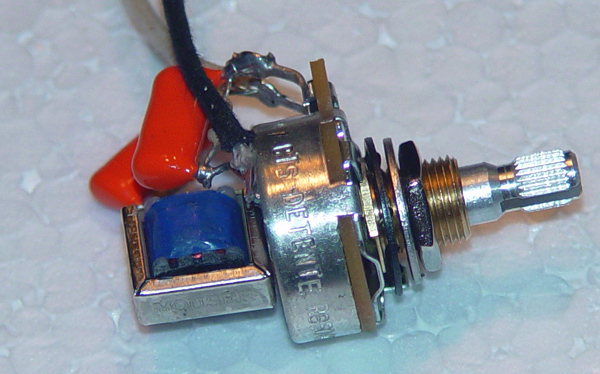 The cap and inductor are wired in series. As you probably know, caps lets treble through easier than low frequencies. The inductor does the opposite by allowing low frequencies to pass through easier than treble. Lets say the cap allows frequencies over 1000 Hz to pass, and the inductor allows frequencies under 200 Hz to pass. When the 2 are combined in series they act as a kind of midrange filter. Here is a graph obtained by running the circuit through a very expensive network analyzer. 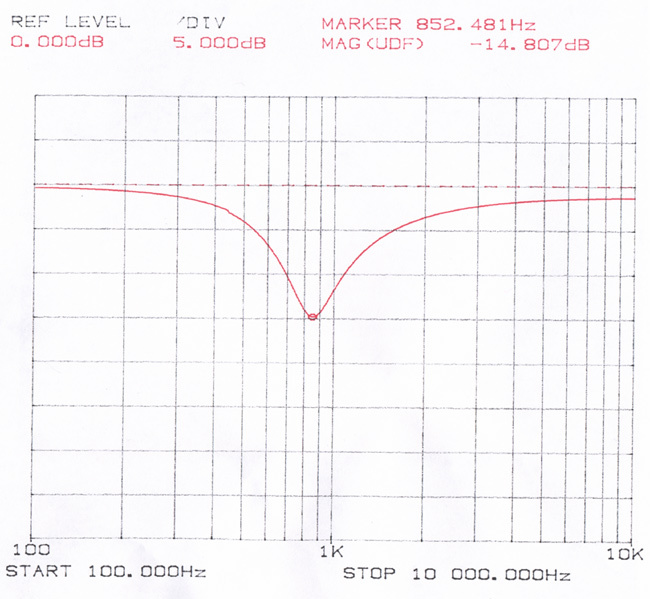 As you can see the mid-cut is around 850 Hz, but this will vary somewhat depending upon other factors relating to your particular guitar circuit. There is plenty of information out there on LC networks. To get you started, you can use the following formula where L = inductance, F is the desired frequency, and C is capacitance. DO I NEED A SOLDERING IRON? YES! It is very easy to install, but you have to make exactly 2 connections. WHAT KIND OF SOLDER SHOULD I USE? Please use 60/40 Rosin Core solder only. DO YOU SELL A CIRCUIT THAT BOOSTS MIDS? To boost mids you need active electronics. We make a killer active mid-boost control called Fat Tuesday.